kokiri: Long time no see. Hopefully, I'm back, after a sojourn in the wilderness. This comes from a game I am looking at for GTL. Through , so far so good for black, methinks, but looks like it must be an overplay - too close to Black's enclosure. a looks more reasonable. How then to respond? I have a few ideas of my own, plus of course as actually played, but i would be interested in others' thoughts in the first instance. xela: Well, my first thought also is a pincer: black a, white b, black c followed by I don't know what. My second thought is maybe black d first--white will probably defend above, then a pincer has more force ... but if white ignores d and plays a, I'm not sure what black's continuation would be. So I'd probably stare at it for a while, feel confused, then play the pincer. fractic: Only around 9k but here's my view. I'd say that any pincer has to be a good move because white gets a weak group while his right group isn't very strong either. 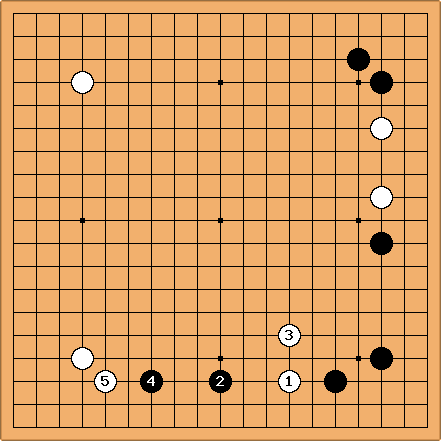 Black has moves at the a's or b's depending on the situation. I like best out of the pincers. 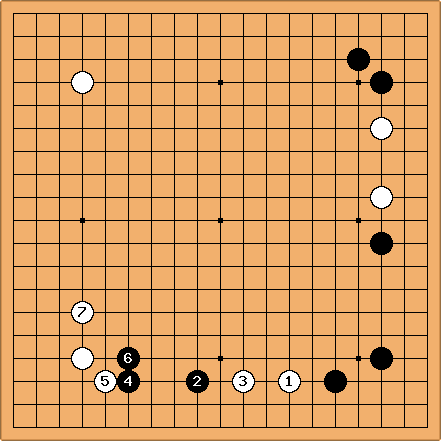 This because white can easily play contact moves on a one space pincer, And it hampers white's develepment with his 44 stone nicely. kokiri - yes, after sleeping on it, I think perhaps it's not so interesting a question. In the game, this is the play. After , carnage ensues. I wonder whether Black's aim on the bottom isn't just to make a safe group (e.g. 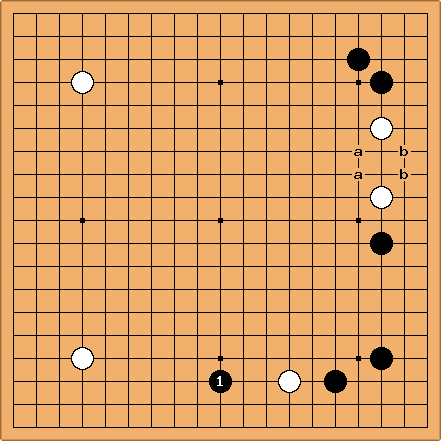 Black @ ) and then the bottom is not really an urgent area, rather than as played, starting a fight? Bill: Well, I think that the question of where to pincer is interesting. High or low? 1, 2, or 3 spaces? This seems like a reasonable plan for Black to me, starting with the 2 space low pincer. xela: My problem with this type of position is that your diagram looks reasonable, but all the other pincers look equally reasonable to me! Can you give any advice on how to choose? Bill: Well, simplicity is a factor. I think that Black has a bit of an advantage. Is there a simple way of maintaining that advantage? For all I know, the actual game continuation is better than my diagram. However, its complexity makes it difficult for me to assess, and it also gives White chances to come back. kokiri - that's something that I have taken out of reviewing games of players 4-5 stones weaker than myself. I often can't refute their (strategic) plays as out and out bad but I find them confusing and my instinct is to play a different way in which I at least think I understand what is going on. I think that the choice of pincer is perhaps less important as the follow-up. 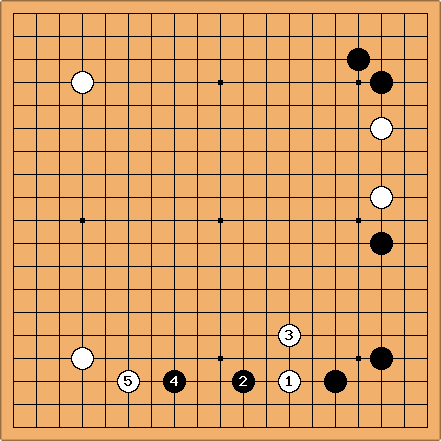 In the game continuation, Black's extension/approach seems to be either trying for territory, or looking to start a fight. Neither of these makes much strategic sense to me. Simply rendering the bottom small by establishing a safe group there puts the pressure on white to make territory elsewhere. Bill: For xela, three comparison diagrams. High pincers give White the option of sliding underneath, which gives a base while depriving the pincer stone of a base. 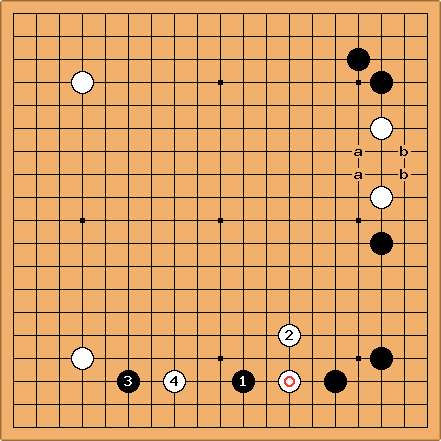 Let's assume that White moves with the pincered stone and then Black makes a base with the pincer stone. Bill: allows , which is a reasonable extension. Bill: is not as severe as above, but is a better approach. However, encloses the corner more solidly. Bill: is a narrow extension, but , , and are also narrow. Black does not seem to have a clear advantage to me. Bill: Of course, these are simple comparisons, and the play need not go this way. In particular, may be a counter pincer. But I think that this analysis is enough to eliminate the 3 space pincer as not severe enough.